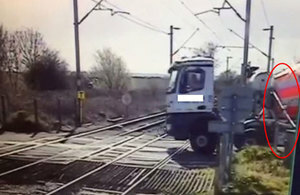 At about 11:58 hrs on Wednesday 13 March 2019, a concrete delivery lorry became temporarily trapped by a lowering barrier on an automatic half barrier level crossing at Mucking, Essex. Shortly afterwards, the lorry reversed off the crossing about six seconds before a passenger train crossed it. The train formed the 11:11 hrs London Fenchurch Street to Southend Central service and was travelling at about 56 mph (90 km/h) around the curved approach to the level crossing when the driver saw the lorry reversing away from the railway. The train driver did not apply the brake. The maximum permitted speed at this location is 60 mph (97 km/h). The lorry drove onto the crossing just before the barriers began to lower and then stopped on the crossing, before reversing in order to enter a nearby construction site. It stopped reversing after a barrier lowered onto it, and then remained stationary for about eight seconds until construction site staff manually lifted the barrier. The lorry then continued to reverse off the crossing. Work at the construction site was being undertaken by contractors working for Network Rail on a project to upgrade the railway power supply between London and Southend. Our investigation is independent of any investigation by the railway industry, or the Office of Rail and Road. We will publish our findings, including any safety recommendations, at the conclusion of our investigation; these will be available on our RAIB website. You can subscribe to automated emails notifying you when we publish our reports.